As many of you will know I’ve been working on a project called ‘Escape from Fusion Earth’ for a pretty long time now, 2 years in fact! It’s a fantasy-style tabletop card game ( and I guess you could say it includes a lot of sci-fi elements too), which has been a big project for all of us involved. When I first got asked to work on this project I was just starting out freelancing on the side, whilst also working part time. I was asked to work on the project by Riley of Influx Studios, mainly based off of my personal work and ideas, I’ve created what I think is some of my best work yet for this project and it’s definitely resulted in me working with other awesome clients too, particularly the work I’ve done with Chrono.gg and more recently another card game studio (unfortunately I can’t share the work I’ve done for that yet!). 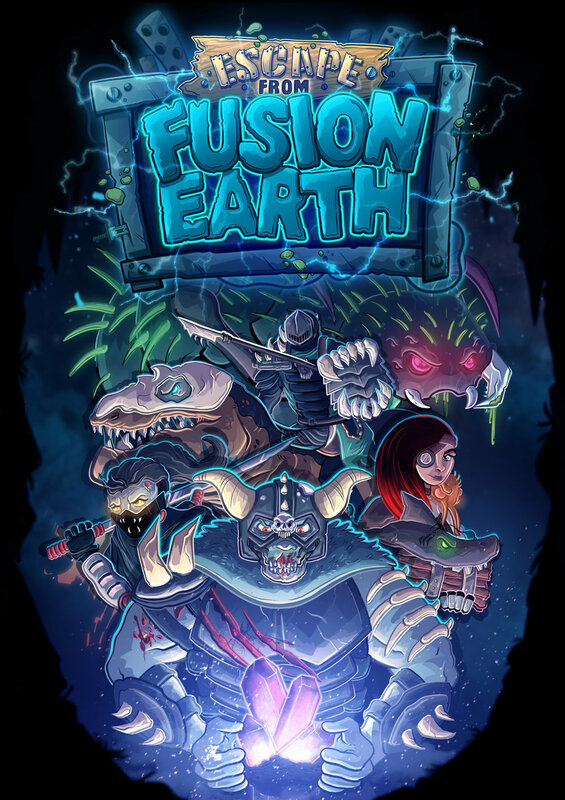 So I thought it would be interesting to go over the process of how I created the cover art for the Escape from Fusion Earth box, which is probably the biggest and most challenging piece of art that I’ve done for the game. I think that the most difficult task for me was that I was going to have to draw all of the characters again in different positions and in new angles, which might be a bit of a weird thing for me to say considering I’m starting to do more concept art and character sheets rather than just illustration these days but it’s something that I definitely still find takes quite a while to get right. It’s one of those things where I know how a character should look from all angles, the dilemma is getting it out of my head and onto paper or a tablet the way I want it to look! So I started out with a sketch of all of the characters, kind of inspired by hero-themed movie posters, it took a while to get a composition which fit in all of the characters and worked well overall. I always make sure the client approves every stage of my process, so first the sketch, then the line art, then the flat colours, next the shading & lighting and finally the effects. Which may sound obvious, but there a lot of artists who will get a sketch approved and then take it from there, straight to a final illustration without ever updating the client until the end, which is a really disrespectful way to approach a project when someone is paying you to work with them. Once the sketch was approved I line worked the piece and also laid down some very basic values to help me get an idea of how the characters would stand out from each other overall. In this case the light was going to be coming from the crystals which meant that the characters would get darker the further back that they were. Then I laid down the flat colours on top which was pretty straightforward as I just pulled them from the individual character cards that I’d already done. I wanted to test myself a bit and try out some different lighting on this piece, I know I tend to always go with the same sort of lighting, a lot of the time I think it’s just become habit, especially if I've got a lot of deadlines and I don’t give myself proper time to step back and think about a piece on a deeper level. I’m trying to become more aware before starting a piece of what I want to achieve with the final illustration, and thinking about that first is helping me to try out new ideas, such as different lighting to what I’m used to. As I mentioned before, I wanted the crystals to be the main light source so it meant that I would be lighting the piece from below rather than above. As you can see it makes the characters look a lot more menacing and makes the illustration more dynamic overall. Although I thought everything up to here was going to be challenging, it was actually what came next that caused me the most confusion and hassle. I had an idea initially to make the background look like shards of glass, with each piece showing a different environment or weapon from the game, however I felt that once the characters were drawn in, it was already quite a busy image and I didn’t want the background to distract from the characters. So in the end, because the game is heavily based on time travel I decided to give the background more of a space/galaxy theme. The reason that I started to get really stuck at this stage was because I felt like the characters weren’t standing out enough from the background, and I also felt like they were getting lost in each other. Usually when this happens I have a mixture of two things that help me out, experimenting, and also having a couple of days away from it. Coming back to a piece with fresh eyes really helps. Big thank you to the guys at Influx Studios for having me work on this project, we should hopefully be releasing a Kickstarter for it very soon so follow me @aldersaur on social media for updates!